I know a lot of us are dieting. Any good recipes you want to share. 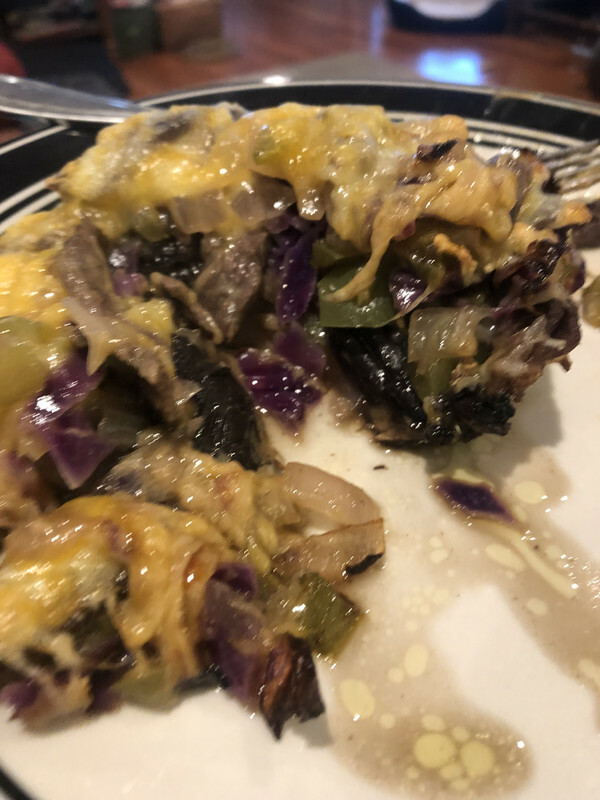 Right now I'm doing flank steak, onion, pepper and a little red cabbage sauteed until tender, then put atop a portabella mushroom cap, covered with cheese and olive oil, and baked at 350 for about 20 minutes. Cheese on the last 10 minutes. It may not be worth a flip but it smells good. Will update with results. Was going to use hamburger to get more fat in the meal but we didn't have any here. Whoa that was good. I seasoned it with Worcesterchire sauce, salt and pepper. Not an Irishguy pic, but a pic none the less. search Pinterest. There are more recipes there than you could ever try. One of my favorites is to cook shredded cheese in a nonstick pan until it’s brown and then put it out to cool and use it as a taco shell. What do y’all do for an on the go lunch? 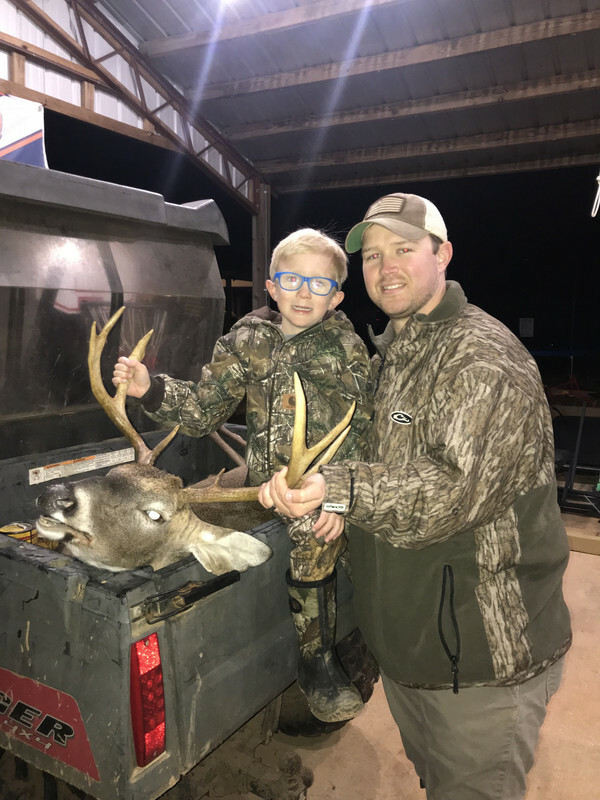 Something I could just throw in a lunch cooler. Something like turkey & cheese roll ups, few almonds, maybe a celery stick & almond butter? Fur that looks pretty good. It's a heck of a thing to stop a beating heart. I definitely want to try the burnt cheese stuff. 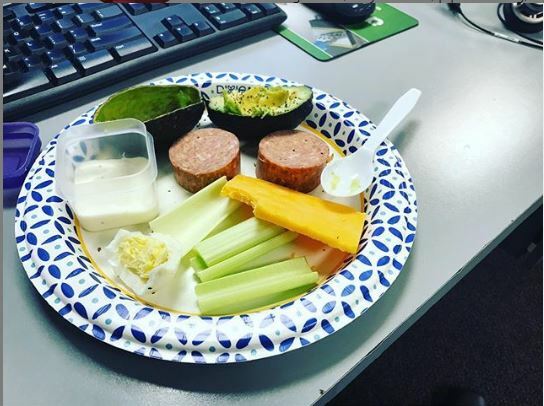 For lunch some days I've been eating about 10 pieces of real thin turkey lunch meat, with lots of cheddar cheese, and an avocado. 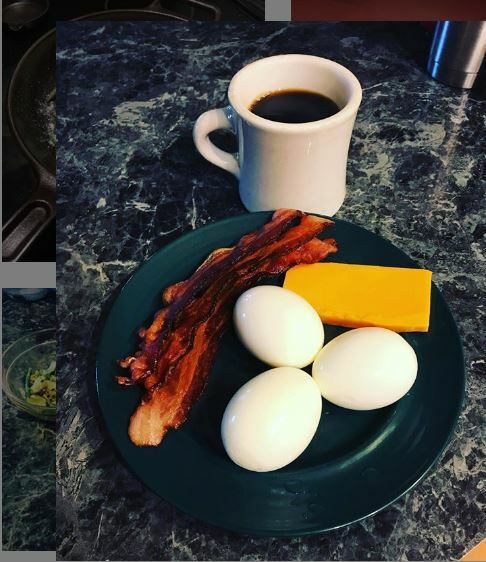 I had heard that Pintrest had lots of keto recipes. I'll check that out. One that I've heard of that comes highly recommended is egg roll in a bowl. The other day I was reading somewhere about thin sliced turkey and ham rollups. Similar to a burrito but use the thin meat as the tortilla. Salads are easy. Lettuce with grilled chicken, cheese, bell peppers, onions, and ranch dressing. Turkey and cheese roll ups work good too. You can have pickles with them, broccoli and celery with ranch, the list goes on and on. Doing "Crack Slaw" tonight will update. In the morning I've been eating cottage cheese and fruit. Started meal prepping my lunch for the week " 1 blackened chicken thigh and green peas. I think I’m going to have a hard time getting enough fat in. 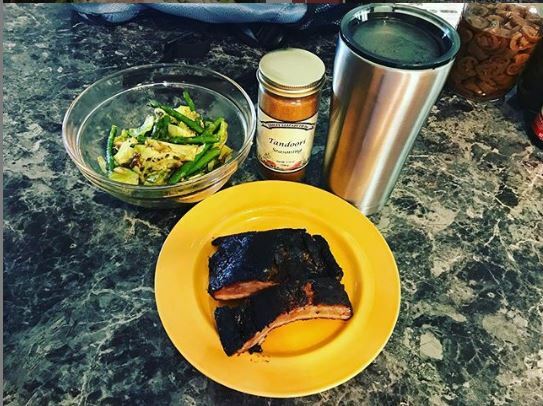 Pm me my wife has a keto Pinterest board, but then so does a thousand other people. Most of the recipes she has posted we have ate though. Crack Slaw turned out great. I wasn't sure at first but I will do it again. Eat one salad with a bunch of olive oil, macadamia nuts, olives and a whole avocado sliced up on it. Dairy is another good way to get fat. Some folks have to watch the dairy though, it can mess with your global serum lipids. I think the main part of eating clean is easy, that is to say, a piece of protein and some roasted vegetables or salad. I have problems with finding ideas for "side dishes." Riced cauliflower is a standby and makes good substrate for the rest of meal. Mix in a bunch of grated parmesan and its like cheesy potato/grits, kinda. Cook onion, pepper, garlic and ginger for about 5 min. Add slaw mix and beef broth cook on medium for about 15 minutes stirring. Last edited by inatree; 04/15/19 10:23 AM. 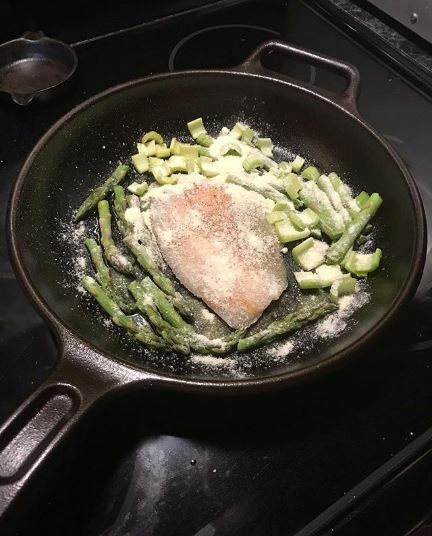 > top pic - left - is a pretty regular deal - 1 fillet of frozen tilapia, lightly coated w/olive oil, Parm cheese, & seasoned with T.Chach's, and a dob of salted butter on top - asparagus & celery, bake on 450 for 18 mins & it's nice & crunchy! Last edited by BamaGuitarDude; 04/17/19 09:59 AM. I had conecuh and cabbage last night. I love it. Dice up a large onion and 1# conecuh, season it with salt pepper and tonys. Cook in medium bowl until sausage is done. Add 1/2 head of chopped cabbage and a large can of rotel (can also just use petite diced tomatoes for less spicy). Simmer for about 20 minutes until cabbage is tender. I bring leftovers to work and microwave. I love my country, but don't trust my government. Boil a head of cauliflower til soft. Put in blender with heavy cream, a little cream cheese, Parmesan and garlic. Blend until smooth. Sauté onion, conecuh, and shrimp seasoned with tony’s, then serve over cauliflower. Tastes an awful lot like shrimp and grits.